When it comes to size, don’t compromise. Home > Renewable Advice > When it comes to size, don’t compromise. 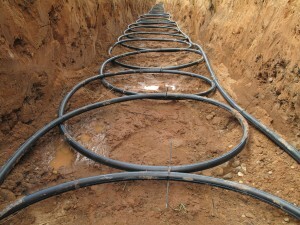 Ground Source Heat Pumps, Your Guide. 03 Mar When it comes to size, don’t compromise. Incorrect sizing of heat pumps by installers is the main culprit of bad installations, at Hero Renewables our years of experience means that we can get it right, every time, and here is how. First of all, you need to find out how much heat your home requires. This is done either by an energy assessor (Energy Performance Certificate), or more in depth by calculating the full room by room heat loss. Once this is complete you will know what energy, or ‘Watt’ energy is required to heat your property to a comfortable temperature throughout the heating season. In exactly the same way you would if you were having a conventional boiler. The heat loss will also be able to tell you the size of radiators, or amount of Underfloor heating you require. Again this is similar to the conventional sizing method, the only difference being the temperature of the water running through the radiator. The lower the water temperature in the radiator the larger the output is to compensate; this also means using a lot less energy. Conventional systems typically run at 70-80°C, heat pumps run at 35-40°C. Calculating the heat loss and Kilowatt hours (kWh) may seem a little boring but it’s a vital part of the design and getting it wrong could lead to all sorts of problems, the kWh are also what the government pay you for producing (The Renewable Heat Incentive). If your property requires 10kW to heat it you would require a 10kW heat pump, with an Air Source Heat Pump that heat would be drawn out of the air and as long as you have plenty of room around the ASHP you’ll never run out of heat. It’s a little different for Ground Source as your limited to the amount of land around the property, we have to work out how many watts per meter of land can be used. The ground stores solar heat a little like a battery and different types of land can store different amounts of heat. If the house requires 10KW of heat and the land can produce 10 w/m you would need a 1000m of pipe buried to collect the heat from the land, if the land could produce 20w/m you would only need 500m of pipe. Problems occur when these calculations are incorrect, if any part is undersized it may lead to high energy bills, the house being too cold or even the land freezing. In some cases, companies purposely undersize to reduce the installation cost, it would save thousands of pounds off the installation cost if you halved the amount of collector pipe and digging you actually required. Or by specifying a 5kW heat pump when a 10kW is required. When considering a heat pump its best to get a few quotations to compare, at Hero we are happy to provide you with a quote completely free of charge and absolutely no obligation. Feel free to contact us on 0808 222 0 111 for any questions you may have.